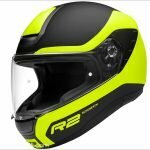 The latest full coverage SR1 helmet released by German helmet experts has brought them further into the motorcycle sport and professional racing helmet arena. 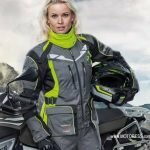 As a woman motorcycle rider, this model is an incredible delight to wear! During the Schuberth SR1 Helmet Review its feather-light weight was truly noticed! Schuberth have been making motorcycle helmets since 1954 and this latest full face addition to their line gives Schuberth Engineered specifically for sport riders and professional racers – a bulls-eye on the target of excellence in a full face sport helmet. The race track-ready SR1, design assisted by seven-time F1 racing champ and motorcyclist, Michael Schumacher provides an extended sport choice to the selections in Schuberth’s current product line. When you take the SR1 into hand you can’t help notice how incredibly light it is. 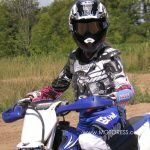 This is a great advantage especially for women motorcycle riders – where we tend to be less muscled in the neck and shoulder area. And a lighter weight helmet spares your neck muscles from strain and fatigue; just 1295g as was the ECE rated 54-55 / Small size we tested. 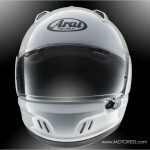 In our test, we tried the European rated version ECE-R 22.05 the highly respected European (ECE) standard for motorcycle helmets recognized in over 50 countries worldwide as well as for AMA and FIM racing including MotoGP. This rating results in the helmet being ever slightly lighter than the DOT FMVSS 218 North American government safety standard version. The outer shell of the SR1 is offered in three helmet shell sizes: small, medium and large. It’s then available in helmet sizes XS through to XXL when combined aim to result in an aerodynamically optimal range and protection. 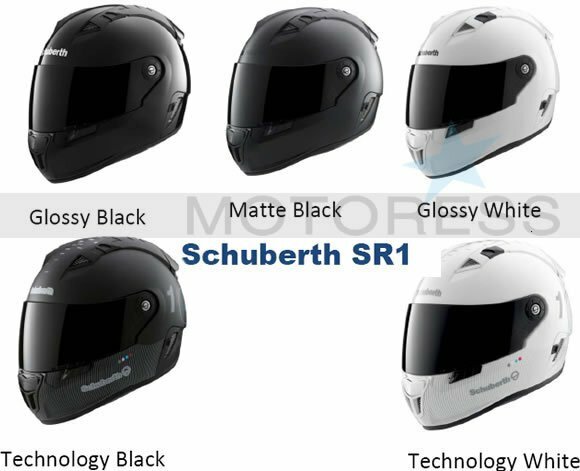 The shell material Schuberth call S.T.R.O.N.G. is composed of fibre and reinforced with an extra carbon layer aiding to its extremely low weight. Its inner shell is made of specially optimized EPS foam Used exclusively by Schuberth allowing for optimal shock absorption. As we’ve shared with you before, Schuberth’s decades of wind-tunnel experience have led to noteworthy improvements in aerodynamics – in fact all their motorcycle and racing helmets are developed and optimised under scientific conditions in the Schuberth wind tunnel. The SR1 is a sport helmet which has been developed for optimum performance on the racetrack which means much attention to airflow resistance. Its large frontal area, narrowing toward the back of the helmet gives it a unique Aerodynamic shape. The upward lift is zero; there’s no oscillatory tendency, no buffeting and directional stability. The helmet also includes a small adjustable spoiler at the back to help increase aerodynamics during racing. The venting is instantaneously effective. Glove-friendly slides open two large diameter ports that angle fast-moving fresh air across and down the back of your scalp before venting through always-open exhaust ducts. You can adapt the profile of your SR1 to your ride by altering the height of the D-Force Spoiler on the back of the helmet to ensure optimal helmet performance regarding the air-stream over the helmet. With it in the down position being closer to the helmet provides a standard down thrust. This works well on motorcycles with fairing or when you’re riding in an upright position. When the spoiler is lifted or hinged up, Schuberth claim a 60% higher down thrust result. This is for motorcycles without a fairing (i.e. Sportbike) and a lower sitting position – ideally when riding in a sport position –reducing lift and drag at racing speeds. The double chin vent can be adjusted to direct airflow to the cheeks or mouth, while the upper port clears condensation from the face shield. Inside, individually adjustable upper intakes push 10 litres (.35 cubic feet) of air per second at 60 mph through the helmet. Optimized in the Schuberth wind tunnel, the SR1 is silent. Tested at 100 km/h where only 88 dB(A) reaches the rider’s ears. Their N.R.S. 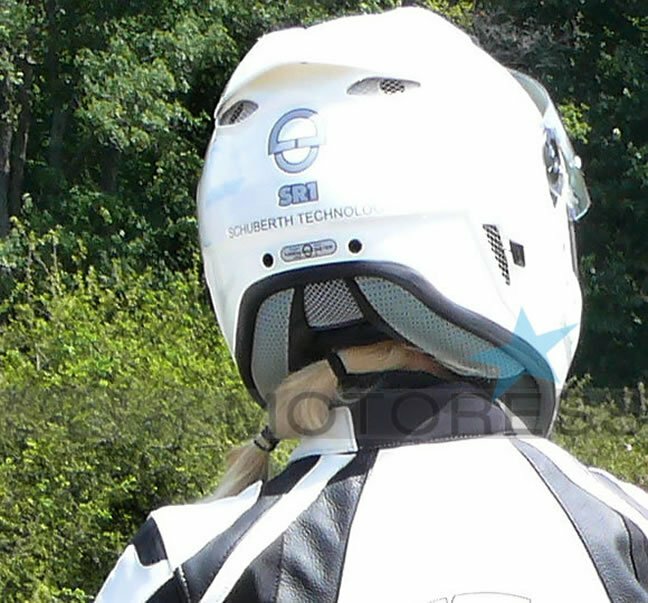 – Noise-Reduction-System- utilizes “windows”, small openings to control the helmet’s acoustics, on the sides of the helmet (as well as removable ear pads). In street mode, the N.R.S. can be closed to reduce noise assisting in rider’s concentration and attentiveness; preventing fatigue. Sound levels are still efficient without eliminating important traffic sounds. In our review, we found using the chin ‘Wind Defector’ included with the helmet provided best results for maximum noise reduction. This, when fitted, deflects undesired wind entry and reduces noise level further. And finally, wearing a neck scarf sealed wind entry especially having a smaller neck. The face shield has a very sturdy feel to it and features a locking mechanism that doubles as a defogger as well. We found removing the shield a little tricky but placing it on, such as switching to the tinted face shield; extremely easy. It uses a push-release system and requires no tools. Schuberth use the Pinlock® Visor for guaranteed condensation-free sight – and that to Pinlock’s double glazing technology. In addition to its excellent fit, the pad system of the SR1 also stands out on account of the complex ventilation and extraction system – with double-coated soft, breathable COOLMAX® materials which do a great job at transporting heat and moisture very well. The lining materials use a skin-friendly Polygene which is anti-allergenic / antibacterial increasing further wear and comfort. The lining head, cheek and ear pads are removable, washable and replaceable. The extremely complete owner’s manual explains the details fully. Of course, you wouldn’t ride without all these components fully in place. The lining further ensures effective ventilation. The Schuberth SR1 is an outstanding motorcycle helmet. The combination of light weight with performance; superb ventilation and low noise levels – in our review resulted in a winning formula. The SR1 goes beyond the capabilities of most sport styled motorcycle helmet brands. The discontinued R1 and S1 features have been included but the SR1 weighs far less and is nearly as quiet. Everything about this helmet feels solid, well made; providing a true feeling of security. We found the outer style/graphics of the Technology version pleasing as well. The only challenge we experienced occurred on the fit and breaking the helmet in. We found it extremely difficult to pull on over the head and recommend wearing a helmet liner cap to assist. Once on, after the first hour we experienced a pressure from the bottom rear of the head in the occipital bone area. This signalled an early end to the ride. The pressure here was unbearable. The shell ridge in this location is not padded as in other padded areas (frontal and cheek). This however may also be due to the sizing- perhaps we needed a Medium shell size in Small. Of course a new helmet’s interior is like that of a new pair of shoes and generally with use, become more comfortable. In summary, our only stipulation with the helmet is with fit and that significant time is needed to try different sizes before determining which is right for you. 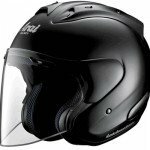 Schuberth helmets are in the higher end price range; however are no means out of line with other high-end helmets from ARAI or Shoei. Yes, the Schuberth SR1 really is worth the money!